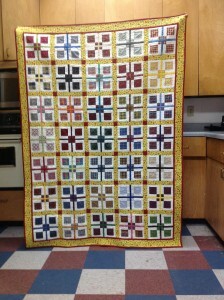 I finally finished the quilt for my grand nephew made from the plaid blocks I won last year. 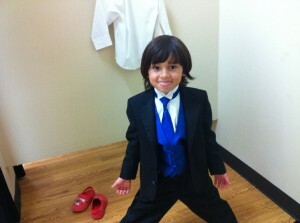 I mentioned earlier he was possibly the cutest ring bearer ever so I am including his picture as well. Along about May I may find time for the block lotto again. time to make another e wedding dress….wedding May 4th. Remi loves trains and Thomas and Friends. 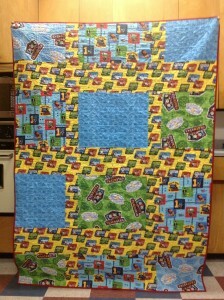 I found Thomas and Friends FQ’ on clearance and added some Thomas and Friends yardage to make it big enough for the backing. I love what you have done with the blocks. I wanted them so badly! That is so cool. It turned out wonderful. Mine is off being quilted. Shouldn’t be long and I will have mine back. Remi is adorable. Personal pics make the quilt and Block Lotto special. The quilt turned out very cut for Remi. Great finish!